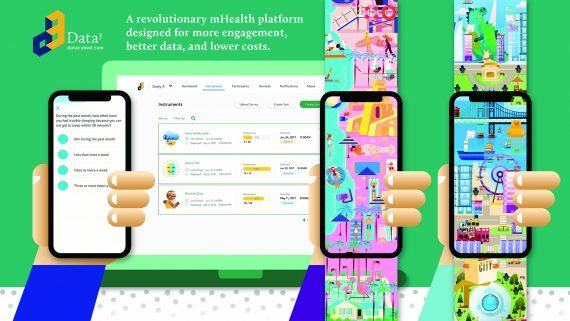 Data Cubed has developed a fully integrated electronic data capture platform and cross-platform app, designed using gaming mechanics and reward-driven behavior change to increase participation and improve retention for clinical trials. Data collection is fully automated, gamified, and engaging, using human centered principles and modern technology. through a number of engaging worlds and earning progress points throughout. The app is visually engaging with bright illustrations and rich interactions designed to reduce to clinical nature of these various activities. Active tasks are treated like games with scoreboards, points, and point multipliers, allowing subjects to be more engaged while providing data on cognition, memory, movement, vision, and other clinical assessments. The system provides hooks for different reward mechanics including digital, cash or real-world rewards to keep patients in the study through it’s conclusion. With the advent of Big Data, the ubiquity of smartphones, and the arrival of wearables and other Internet of Things (IoT) devices, it is now possible to collect hundreds of Real World Evidence data points and to convert them into a digital structure. D3 provides a platform which facilitates deep phenotype understanding, allowing for personalization of treatment and enabling the growth in precision medicine. These tools capture an unprecedented amount of data, and provides deeper understanding of the human condition. The goal is to improve patient engagement, identify critical treatment trigger points and through artificial intelligence, make predictions that will improve treatments and address behaviors to improve healthcare. All in a package that keeps people at its center.